American, Briton win the tourist race title - Integration Through Media ....! 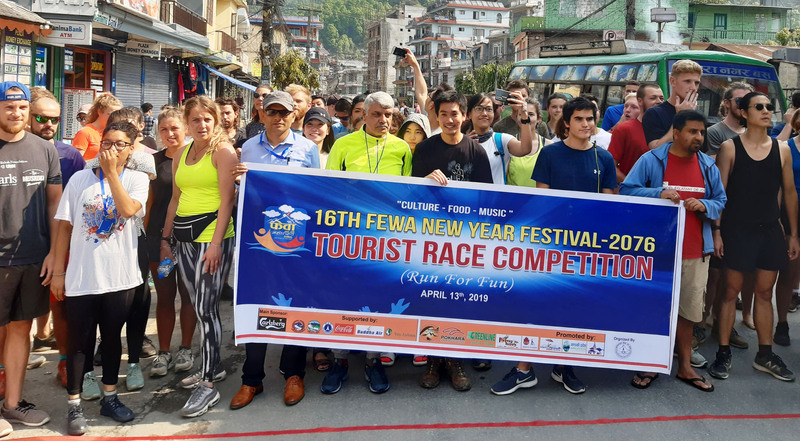 KASKI: American Brian Kin clinched the title of tourist race held in Pokhara under the ongoing 16th Phewa New Year Festival. Briton Alex Hoccon became the second and Canada’s Mykar Bakker finished the race coming out the third. The event was oranised with a view to promoting Pokhara internationally. Similarly, towards the women’s category, Britain’s Hannah Karas become the winner while French Violette Lefer came out the second and American Sarah Coyne became the third. According to event coordinator Anil Singh, 66 tourists from several countries took part in the completion. They ran from Hallanchowk-based Peace Plaza Hotel to the southern gate of Ratna Temple. Pokhara-Kathmandu flight ticket (either Buddha or Yeti Airlines), cocktail dinner at Busy We Café and massage facility at Seeing Hands are gift vouchers for the winner. The second prize comprises a 30-minute tandem flight from Annapurna or Pokhara Paragliding company, a cocktail dinner at Busy We Fare and massage facility at Seeing Hands while third prize has facilities for green line tours ticket for Pokhara-Kathmandu route, cocktail dinner and massage, said the organiser Western Regional Hotel Association.